You can use this as one of your SEO strategies to create engagement. One of the things we do here, aside from trying to help others to figure out how SEO and Google works, is to deeply research any pattern and data we can, in order to best figure it out for ourselves. We keep a close eye on Google and the likes, ask questions and sometimes even make ranking experiments to make sense of what goes on behind the scenes. But as is the case with all human observation (from quantum physics to sociology), it is impossible to study something without – at least at some point – becoming part of what you study. We became part of our own study recently, when an article we published 4 months ago got picked up by Reddit, the social media network or self-professed “front page of the Internet”, in one of their sections (called subreddits). The article was a prediction attempt at how Google might “read” and rank your images in the near future and it was adequately picked up by the Futurology Subreddit. You can use this as one of your SEO strategies to increase your website traffic. Whether Reddit really is the front page of the Internet is open to debate but the community is definitely a force to be reckoned with: the futurology subreddit alone boasts (as of now) with over 2.2 million subscribers. Not all of them may have been actively accessing the subreddit at the time our article got onto it, but we definitely felt an immediate and significant effect of our presence over there. What is interesting, beyond the effect itself, is how to interpret it, as we will shortly discuss. The immediate effect that we saw on closer analysis was the impressive (if you look at the chart below) spike in website traffic around the day it was picked up by Reddit (January 5th). Within 1 day, the organic search traffic on our blog hit 20 000 visits, an impressive feat by any standards, but also a quite singular one in recent history if you look at the rest of the chart. Of course, quantity does not necessarily equal quality, as evidenced by the no-less-dramatic drop in average session duration (almost inversely proportional to the spike in the number of visitors). On average, the users that day spent about 9 seconds on our landing pages. But before we sink into the pool of “youth-these-days” disappointment, remember that averages are statistical tools which can easily deceive. In this particular case, the average is a relative measurement which sometimes blurs the facts: it is likely that the absolute number of people who spent a really long amount of time on our page was still as high as (if not higher than) on any other day. Their numbers simply got cancelled out in the sea of users who clicked and bailed in just a couple of seconds. Statistical clarifications aside, the fact remains: dramatic site traffic increases in the number of visitors does not necessarily mean a dramatic increase of the quality visitors. So what exactly happened to so many users that felt the need to leave the page as soon as they got there? Because the bounce rate was at an all-time high (96.19%), meaning that a vast majority just clicked, glanced and left in a hurry, just like you can see in the chart below. Accidental clicks (followed, naturally, by hurried departures) are probably responsible for a large portion of the bounces, but surely they can’t all have been accidents? The profile of the reddit user is also something to take into account at this point. They are likely avid readers, parsing through pieces of content in rapid succession without necessarily scanning the title in-depth before clicking on it and only deciding on whether they want to read it or not just seconds after the page has loaded. Another scenario to consider is that Reddit is first and foremost a community and its users are primarily preoccupied with interaction (even when it’s for the purpose of finding out information). Comments section are a lot of times the actual prized content and not just a redundant annex to the quality content. Use this situation as an example to look out in your content marketing strategy. It is then not unthinkable that while most people who would comment on the topic would want to read the blog post, there was at least a considerable number of those who were more interested in the comments than in the article itself. There are probably a lot of other factors at work here to explain the staggering bounce rate. Despite all the bounces, however, the mere presence of so many visitors in so little time led to an even more impressive effect. As expected and presented above, the average session duration was very low. Yet, as the increased website traffic went away, the average session duration increased. This means that our usual readers platform maintained their behavior and after all the buzz in our site’s traffic, things got back to normal. Because the article was all about Google images and talked about this a lot, it actually got noticed by someone else, namely by Google itself. Well, it was probably noticed the first time around, but this time it got really noticed; it was a keyword opportunity. Like that time in college someone threw a party and everyone came. People knew that person before, but after the party they really knew him/her. At least for a while. Much like this fictional American themed example, our fame was intense but short. A short keyword research can help you generate and pin down ultra competitive keywords with high search volume. We had a truly impressive search rankings spike for what is undoubtedly a very competitive phrase (“google images”), getting from the 74th position to the 8th in Google search results in just one day! That is a feat by any standards. Yet, as you can see from the chart below, after just a few days our website rankings had a big downtrend. We won a lot of points in terms of SEO ranks also, going from around 500 to around 1350 (almost three times more). Alas, our visibility fell less abruptly than it rose, but by the end of the month the levels had gotten back to where we started. By then, it was probably obvious to Google that what had happened on the 5th had been an isolate case and not the rule. Although the saying goes “impressions don’t buy, real people do, we cannot ignore the high number of impressions registered on the 5th of January: almost 60.000. For a quick reminder, impressions are the number of times a post is displayed, whether the post is clicked or not. People may see multiple impressions of the same post as, for example, someone might see a page update in news feed once, can see it a second time when a friend shares it and so on. Even so, as you can see from the chart in the Google Webmaster Tools , the number of impressions reached for the queries containing “google images” is impressive and need to be taken into consideration as an important factor in our present research. Our 15 minutes of fame lasted a bit more, but not by a lot. Everything happened on the 5th, as the organic traffic spike confirms. You can see this yourself, in the screenshot below, taken from Google Analytics. As more and more people saw the thread, up-voted it and commented on it, the post got pushed higher and higher and started to attract even more views and comments. Soon enough, it was all a matter of the rich getting richer. As with most threads on reddit, the buzz eventually died out and other posts took turns at the popularity contest. Can traffic increases influence the keyword ranking positions in the SERPs ? It looks like it could be. Yet, the author also stresses on the importance of concentrating more on obtaining links from webpages that can convert traffic rather than looking at the outdated metric of PageRank for example. So, concentrating on obtaining quality traffic, from social media or not, is crucial and you can monitor that traffic using free tools Google Analytics. Nevertheless, we cannot ignore the benefit of referral traffic in terms of how it impact SEO rankings within Google. As in our case, it seems like obtaining links that provide a high volume of referrals and click through data impact search rankings within search engines. We cannot draw a 100% certified conclusion here but we can assume, having our own experience as a starting point that referral traffic may influence Google search rankings. More research needs to be done on this matter in the future (and we are probably going to make an analysis of this kind in the near future) but I think that our findings on this situation is one that needs to be exploited and one from which there are a lot of lesson to be learnt. 6. 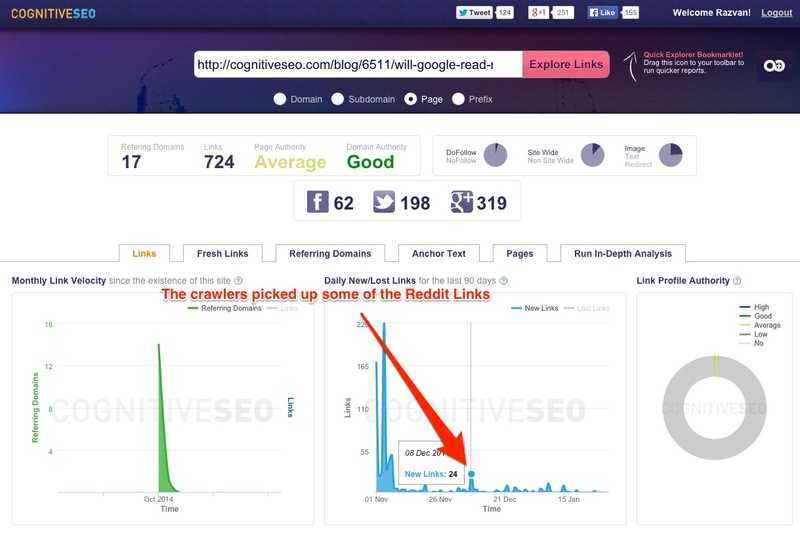 Could the Inbound Links Rank Signal Boost Our Google Rankings Actually? Of course, this whole analysis is basically trying to establish a cause-effect relationship between two elements : the referral traffic and the SEO rankings. The basic conditions seem to be meet: one happened before the other, there was a co-variation in one that corresponded to a co-variation in the other and the two are relevant to each other. However, we have ignored one additional criterion of a causal relationship: that there are no alternative causes that could lead to the same effect. Also, I don’t think that the brand awareness generated via the Reddit link could have led to these increased SEO rankings. The moment the organic ranking improvement happened correlates directly to the time of Reddit posting. There is one such possible alternative in our scenario: the Reddit link that was posted was a dofollow link that could have potentially influenced the ranking of the page. That inbound link merged into a broken link after a day, as it went further down the Reddit Category as new Reddit posts were added. Looking at our analysis below, you can see that the subreddit has both a high link authority and a high domain authority. While the actual measurable value and impact of the referral link is not very clear, it is definitely a different factor to take into account than the simple increase in number of visitors. Could only one referring domain cause such a spike in rankings and in only a couple of hours since it was published? We cannot be extremely sure about this but is not unlikely though. We picked up some of the Reddit Links and analyzed them in order to see if the scenario where one domain could have boosted up so high was possible. As we browsed around the links we observed that indeed, most of them were links with good domain authority, yet, nofollow. So could one inbound link from a high authority domain improve the search rankings and organic traffic to the top almost instantly for such a competitive keyword or did the actual traffic signal boost it? This is open to testing but my gut feeling tells me that there is a combination of the two signals and that both links and traffic contribute to such considerable spikes like the ones we have seen in our case. As another personal experience in inbound marketing, I noticed that social media traffic boosted some of our other posts when people started to share them more aggressively. There are lot of things to discuss here and as listening to others’ opinions and analyze them is one of a researcher’s best skill, we would be more than happy if you shared your opinion on this matter. So, what do you think? Does referral traffic influence SEO rankings? Or can only one referring domain boost a site’s rankings from a low position to a top position in only a couple of hours? Is external traffic a Google ranking factor? Could this be an SEO technique that can be scaled? I knew, Reddit gives you remarkable referral traffic with highest bounce rate, but I did not know it could help organic rankings as well. My question: Length of Keyword you were tracking? Because long tail and sometimes unique keywords picked up by Google rapidly with one or two links from a social bookmarking site or link sharing site. the keyword is “google images”. You have all the data above. I forget the exact patent and my details might be a little hazy – but Bill Slawski wrote about a patent that described Google actually tracking user clicks on links (as a form of “user metrics” perhaps). It seemed to me like a way to cross-check / vet the significance of a link. Secondly I have seem similar behavior as shown above a number of times (although did not dig in as in-depth) but at least anecdotally, it appeared that a viral boost (from Hacker News in my client’s case) instantly boosted rankings. In his case the rankings stuck because the HN post followed with a lot more traction in social and links off of that. But HN was the initial boost. I’ve stuck to the philosophy for a long time that the best mindset if you want to improve rankings, is to focus on natural traffic from outside search (referrals, social, etc) and in one way or another this will be rewarded. could be. Yandex does it for their commercial queries and it works well from what I understand. they user user data and traffic data. the same as here. more studies should be done in this area. a lot of SEOs don’t think this is possible though. We have the same graph from GA, the only difference is there are two traffic spikes from Reddit and the traffic was significantly lower! Unfortunately, I do not use cognitiveSEO tool -that would help a lot- and I did start watching rankings no earlier than the next day. So, I really cannot say if the boost came from the high PA dofollow link, or the actual traffic signal. If I had to choose between them, I would bet on referral traffic. It’s almost impossible to believe that just one link brought my post in the no.2 position of Google for a high competitive keyword. Nevertheless, I am really looking forward to more tests of yours. It got a lot of traffic. I noticed something very surprising in WMT and our rankings locally. Everything got a huge boost temporarily for a few days. Looks like it does effect rankings. They can definitely tell when your site is getting a lot of traffic and from where. can you share a GWT print screen or GA to show the readers what you are talking about. that would be great! The post above was published on the 25th of January. I’m in a facebook group that has been discussing the impact of CTR on rank. Seems like a strong factor based on what people are saying. I’ll have to look for the name though. Something about Crowd SEO I think. I start my blog 6 month ago and using social media & social networking service for promote my blog. I dont have 20k traffic jump but i see the same pattern. I did some research and i found my article received few links from other sites, mostly citation. Probably that’s what happening to you? i think this story is different. This is a nice case study. reddit is awesome both for traffic & seo ranking. Referral traffic may influence search ranking due to lots of social sharing that may result into extra links from some authority sites that pick the article up and give it a mention in their publications. But in your case, because the effect is instance, I guess it might be as a result of the CTR and if at all social signal affect ranking. But is a clear case of people talking about it and Google think is what people need. Just a quick question, does organic traffic with low bounce rate increase search engine rankings? my keyword gets clicked X amount of times more than competitor for keyword and the bounce rate is low will I eventually go up in the rankings? I have seen the same pattern in the past. I had a keyword struggling at the bottom of the first page of SERP and the page was referenced in one of the forum as a answer to a user question. In the first day, the traffics to that page spiked at tripled. I noticed the spike in traffics. I thought that the visitors are from Google, so I checked the ranking and I saw that the keyword is ranking 5 pace upper nearly at the center of SERP. Of course the traffics were mostly from referal not from Google. So yes, referal traffics improve ranking. There is something called Social Network Law, a mathematical algorithm that governs all social networks and search engines. This would explain a spike accompanying traffic. Essentially in any network once a certain volume is reached there is an explosion of organic traffic. This would explain the spike which means logically there is no further need to explain the boost in traffic. What do you say about traffic from irrelevant sources for a business? For example, we run a local textbook rental and sale store. Apparently there is a similar store in Australia. According my Google Analytics report search queries related to Australian bookstores are my highest source of organic traffic. Is this detrimental in any way? Hi, Dylan. As the study shows, it seems that traffic (even if it’s irrelevant)increases rankings but only on a short period of time. At the end of the day, what I guess interests you most is an increase of the quality visitors. Yet, I do not think that it’s detrimental for your site from an SEO point of view. Does refferal traffic improve alexa rank? This post will be very helpful for the begaineer SEO worker who are new in this field. I am new to this issue, but for me, it elucidated several questions. Congratulations on your knowledge on the subject. Thank you very much. I am new to this issue, but for me, it elucidated several questions. Congratulations on your knowledge on the subject. I run a blog that has less than 5,000 visitors per month but I have noticed that an authoritative,niche related, do follow link has boosted one of my page 5 keywords to the second page. I’m sure its gotta be a combination of both traffic and authority though. something similar happened to me, my site got a link from a site that has a very high DA, and came a few visits from that link, and coincidentally my site came up with some keywords. I keep monitoring to see how far it goes. Whats your comment about this kind of link building? Btw, I have also experienced the similar situation but I used pinterest to drive traffic. But, unfortunately, the ranking improvement is just temporary. Does it also happen in this study? or, Is the ranking improvement permanent? Very in depth post! Can you please tell me how can I improve traffic to my website.